Is Patriots’ aggressive Deflategate stance a smart play? The Patriots won this year’s Super Bowl with defense. Now the team appears determined to win the Deflategate public relations game with defiance. The billionaire patriarch of New England football sounded nothing like the man who said in May that “at no time should the agenda of one team outweigh the collective good.” Instead, he returned to the more aggressive stance he originally took in January, said he regrets the concession, and declared his full support for Brady. The National Football League Players Association filed a lawsuit against the league Wednesday on Brady’s behalf. The question is whether Kraft’s gameplan is the smart play for a franchise that is not only a championship-winning machine but also a $2.6 billion business asset and a marquee member of the country’s most popular sports league. 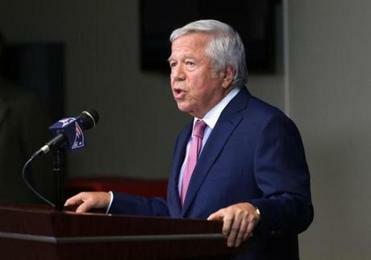 Until recently, Kraft was famously influential — and chummy — with NFL Commissioner Roger Goodell. His public challenge to league authority would seem to jeopardize that status. The Patriots owner apologized to fans and said he regrets not appealing the team’s penalties levied by Roger Goodell earlier this year. 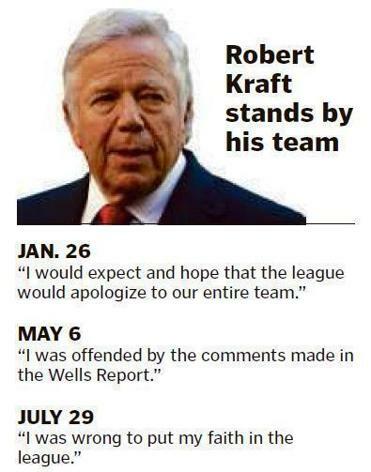 Yet others contend Kraft’s pivot was wisely calibrated. He may look hot-headed or petulant to noncitizens of Patriots nation, but in a sense, they don’t matter because they aren’t the ones who buy into the brand anyway. The important audience is the ardent core of supporters who invest in tickets and gear and tune in each week during the season. They already believe their favorite team was unfairly targeted by a bogus investigation and disciplinary process and don’t want to see Kraft cede any ground. Indeed, many Patriots fans seem more devoted to their team — and their quarterback — than ever, despite accusations of cheating. According to sales results released last week by the NFL Players Association, Brady’s number 12 jersey was the league’s bestseller from March through May. Much of the criticism lobbed by Patriots fans in barrooms and on sports radio has centered on whether Kraft fought the league hard enough. Kraft said Wednesday that he believed his earlier decision not to appeal penalties against the team — a $1 million fine and the loss of two draft picks — would lead to reduced discipline for Brady. With the NFL holding firm on Brady’s suspension, Kraft apologized to fans for yielding. In other sports scandals, club owners have often bristled at discipline but ultimately bowed to league authority. In 2012, the NFL suspended New Orleans Saints coach Sean Payton for an entire season and docked the team $500,000 and two draft picks for a bounty program involving extra payments to players who injured opponents. The team issued an apologetic statement and later declined to comment when linebacker Jonathan Vilma, the biggest star implicated, filed lawsuits against the NFL and Goodell. More recently, the New York Yankees turned its back on slugger Alex Rodriguez when he was suspended for the entire 2014 season for performance enhancing drug use. The team backed Major League Baseball’s decision and reportedly considered trying to void the remainder of Rodriguez’s contract.